“Why am I the one always left to do the cleanup? It wasn’t me who made this mess!” I view the aftermath of a hypomanic episode with horror and disgust. Oh. Dr. Jekyll and Mr. Hyde merge back into one fucked-up being. I did this, no one else. The sensation is both familiar and disorienting. But it is always sickening. Spread out everywhere are the beginnings of ambitious projects. Each undertaking is essential, but abandoned for the next, more pressing one. It’s not that the new seem more important than the current. It’s just that each new idea must be acted on immediately, before it disappears! There’s no intention to discard the last project—I’m going to get back to it. The great endeavors, piling higher and higher, threaten to spill over the windowsills and into the street, exposing glittering but strange ideas to my neighbors and the world. During the high period this never bothers me. My life is an open book, one of which I’m proud. You don’t like what I’m saying? I’ll either dismiss you as unworthy, or take you on like a prizefighter. Then comes the requisite sharp dive that always follows the high. I plunge deep into the black water of the river Styx. After a gargantuan struggle to surface, I’m forced to tread water to keep from drowning. This is my sentence in Hell. Tears stream down my cheeks for so long that my face gets chapped. Slowly I pull myself out of the murky depths. I re-examine the projects begun, the enthusiastic letters sent and received, the ideas that bubbled up faster than I could record. The project notes all begin in organized fashion, bullet-pointed, well thought out and written with attention to detail and syntax. Soon they begin to drift from one notebook to another, then to Post-It’s, then to the odd scrap of paper. The backs of envelopes have notes, beginning in a normal size, but getting smaller and smaller toward the bottom. With no space left, the tiny letters are forced to march up the right margin of the envelope, bravely hanging on upside down until they reach the left side and descend. Some are color coded, but there is no key. Without a manic Rosetta Stone with which to decipher them, the meaning of the codes is lost. In addition to the typed and handwritten notes, there are those dictated into my phone and tablet, digitally recorded into Notes, Stickies, and emails to myself. Organizing these notes into manageable order is a dubious task. Is it even worth the time? I remember staying up all night, working on my laptop, and feeling desperate when I moved too far away from it. The ideas had to be recorded before they disappeared from my fragmented memory. Some of the sketched-out ideas are so impractical as to be laughable. The tricky thing is, many of them are excellent. They approach problems from original angles. They are not only worthy of follow-up; they demand it. Thinking outside of the box is easy when there is no awareness that the box exists. “Remember that proposal I was telling you about?” I begin nervously, hoping to clarify for a friend a conversation we’d had when I was hypomanic. She had probably been humoring me as I explained the idea. In a way I’m relieved. My perceptions haven’t all been off, then! At the same time I’m filled with a profound weariness at the impossibility of following through on every recent brainstorm. I’ve been living in a rainforest, and the ground is sodden after the deluge. So, at least that idea was good in the Real World. And I know the same is true of some of the others. But who will do it? It’s too much for one person—at least in a post-hypomania depression. By now I’ve wised up to the fact that Superwoman has left the building. 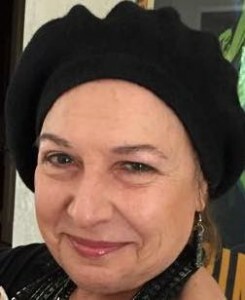 Laurel Roth Patton is a writer and speaker; retired educator, librarian, and textile designer. An education junkie, she has a BA in Art, Spanish, and Jungian Interpretation of World Creation Myths; a Master of Fine Arts; and a Master of Library and Information Science. Her work has been published in print and online. She fights stigma by telling her story to community groups, in essays, Facebook, blogs, and to anyone who will listen. She lives in the San Francisco Bay Area with her husband, near their daughter, and in the vicinity of their wannabe feral cat, Xena Warrior Kitty. Hypomanic in Wonderland! Terrific metaphors to describe the upside (maybe) of our illness. I hope to read something by you sometime soon! Thank you, you have encapsulated the hypomania extraordinarily well… the fine line between madness and genius is so fine, I use these times much better now, and follow up on things, that I started with good intentions, it’s great to be able to share the ideas and put them out there, when you’re not boxed in and feeling limitless there is so much space to explore. Thank you, again. Thank YOU, Carolyn! I think we’re all mad geniuses here. 🙂 It is true that if we can keep track of some of the ideas that come in that avalanche, they are golden. It’s great to hear how that’s worked for you. Enjoyed your post! I think most of us, if we are to be honest, can identify with much of what you are saying. Thank you. I really appreciate your comment, Ellen. Thanks for becoming my FB Friend! Aww, Diane. You know I love you. I’m so glad that when we met, even though when we got together in New York I was in the throes of hypomania, we had such a good time! I know you get it. And yeah, no spinach in my teeth for this pic. lol To more good times!